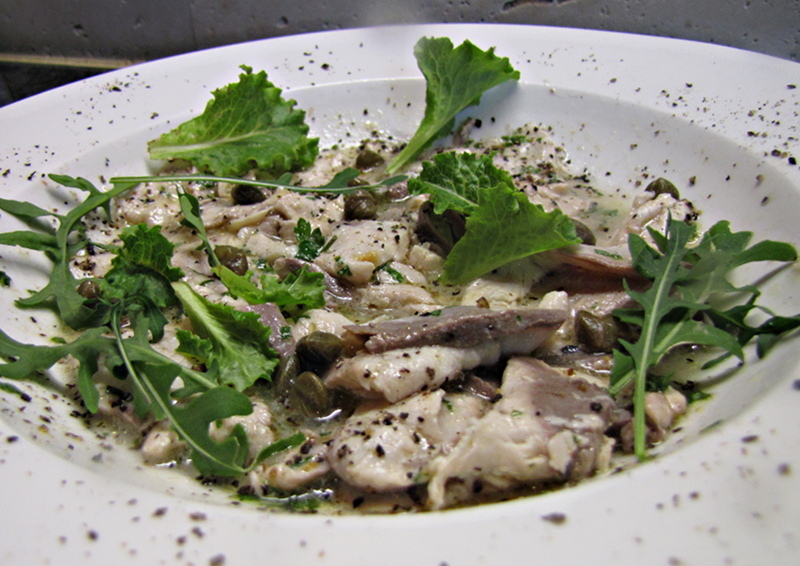 We started off this carb heavy evening with light and fresh Yellowtail Carpacchio. I covered raw fillets of yellowtail with some olive oil and lemon juice, let it marinate for an hour and seasoned it. The lemon juice “cooks” the fish and you end up with a lovely fresh dish with minimum effort. 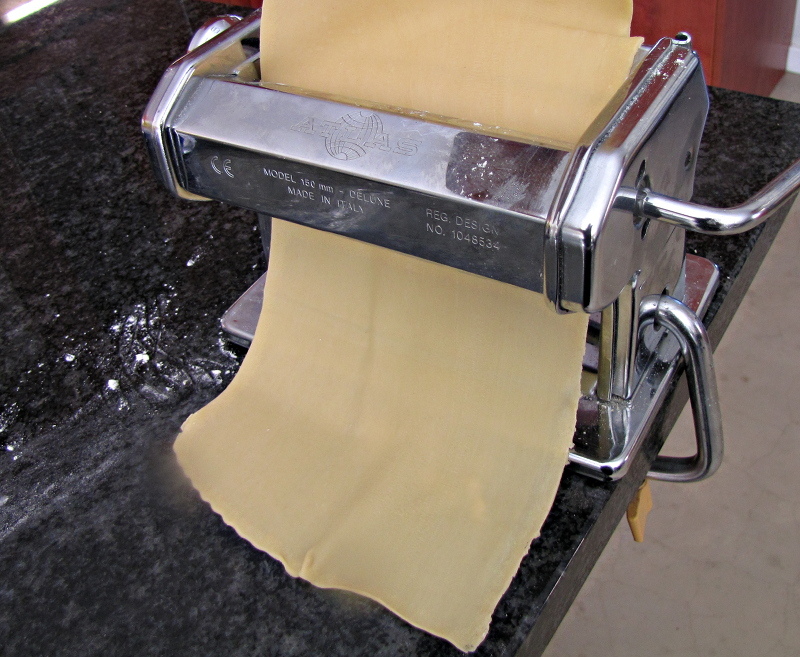 There are loads of recipes for fresh pasta, but I tend to stick with the one in my pasta machine’s manual. You use 1 egg for every 100g flour – no oil or salt. I prefer to use 00 flour but did not have any so made do with bread flour. Make a well in the flour, add the eggs and mix with a fork until completely blended. 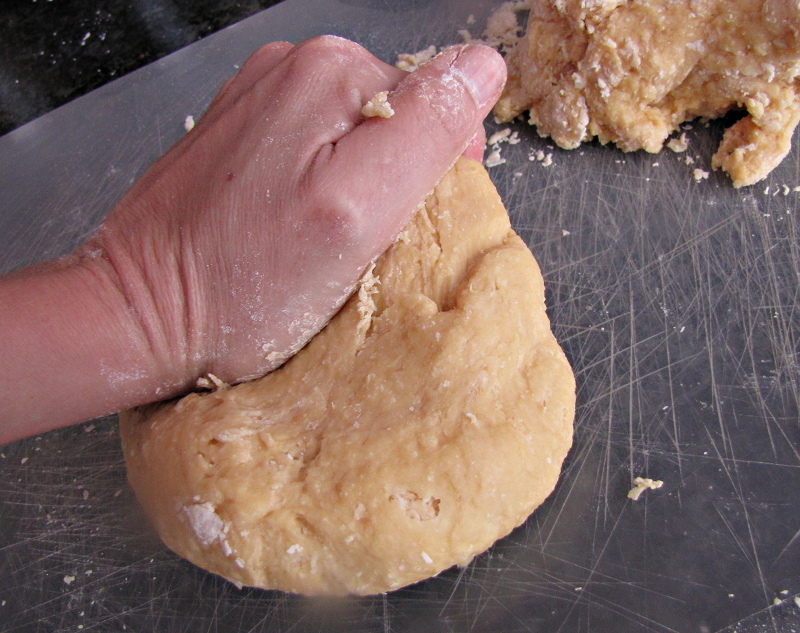 Knead until you get a homogenous and consistent dough. 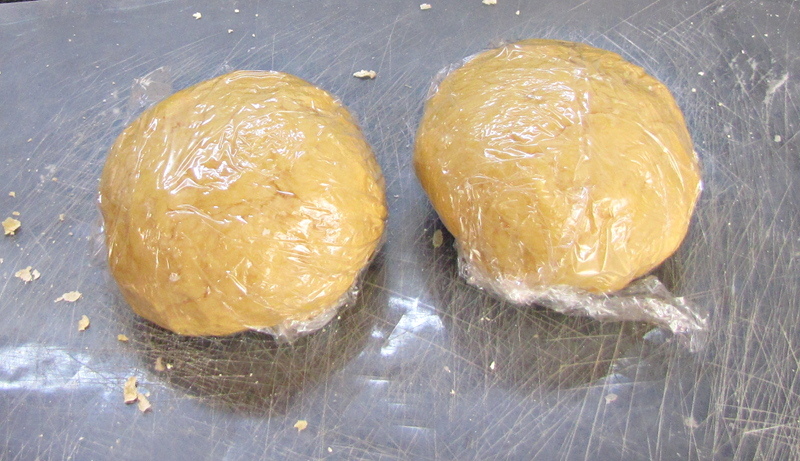 Rest the dough wrapped in cellophane for at least 30 minutes. Then roll out until about 1mm thick. 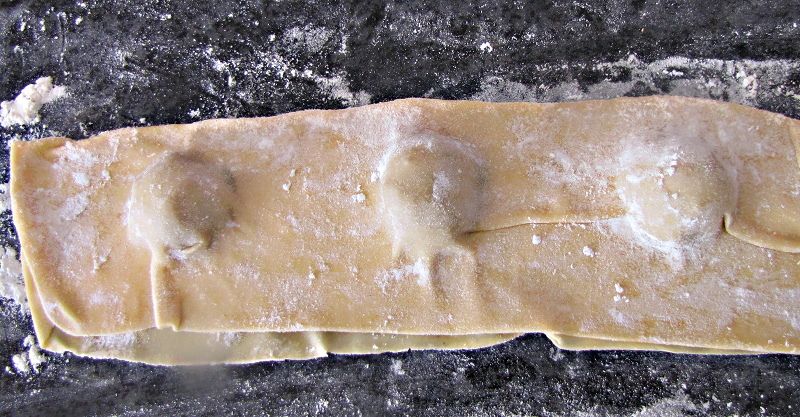 Place heaped teaspoons of the filling onto a sheet. Brush the sheet lightly with water and fold over. 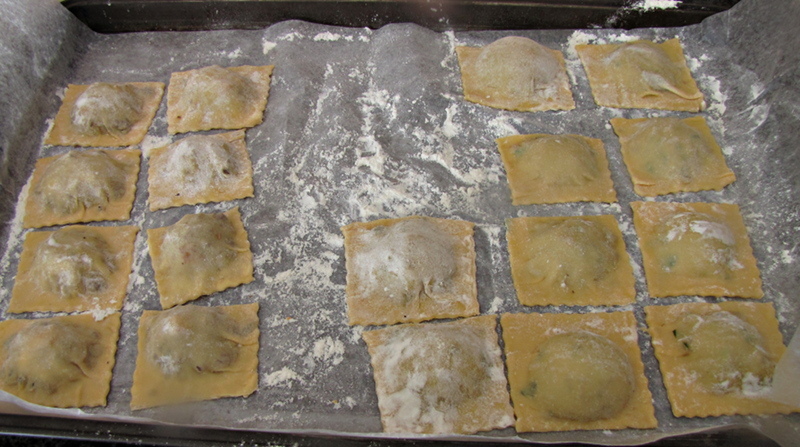 Press down around the filling to get all the air out of the ravioli. 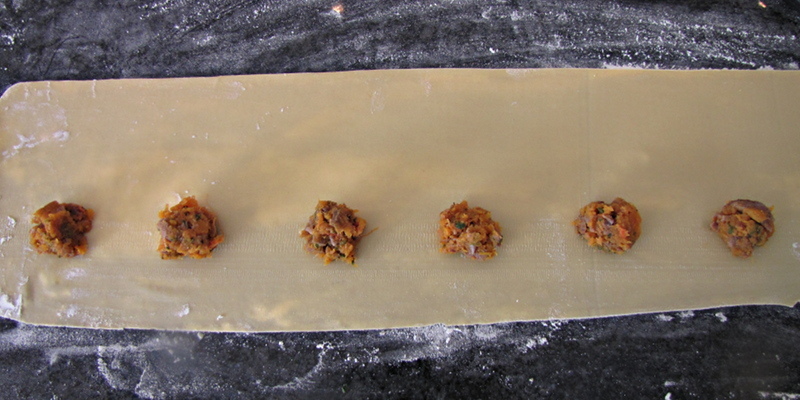 Trim the ravioli and cut between them. Place on a tray sprinkled with flour until ready to use. 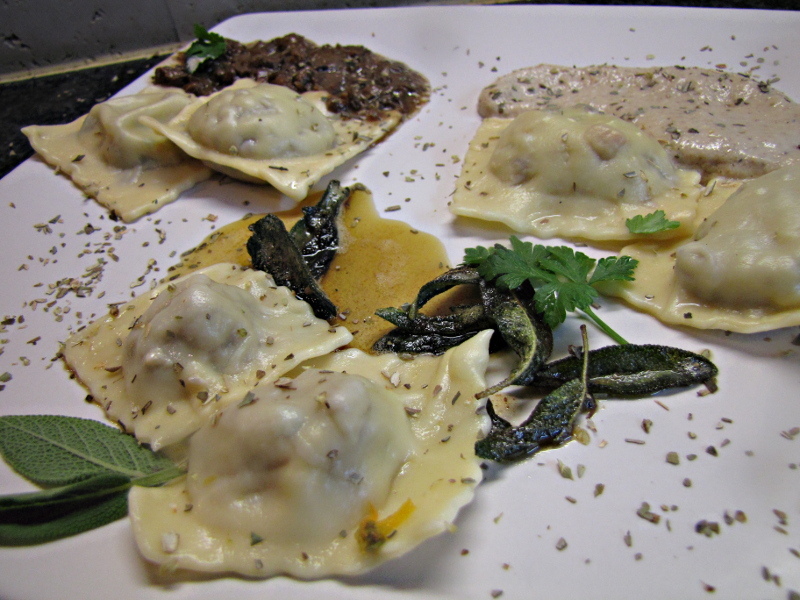 I kept the fillings for the 3 ravioli’s very simple as to not have too many flavours on one plate. Sautee the onion and garlic in butter until softened. 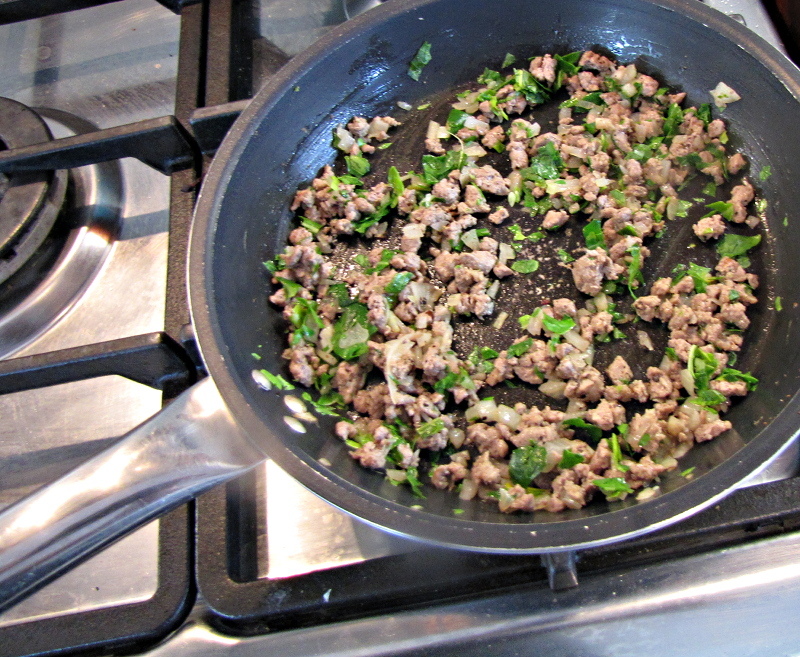 Add the veal and cook, stirring, until cooked through, adding the spinach during the last couple of minutes. 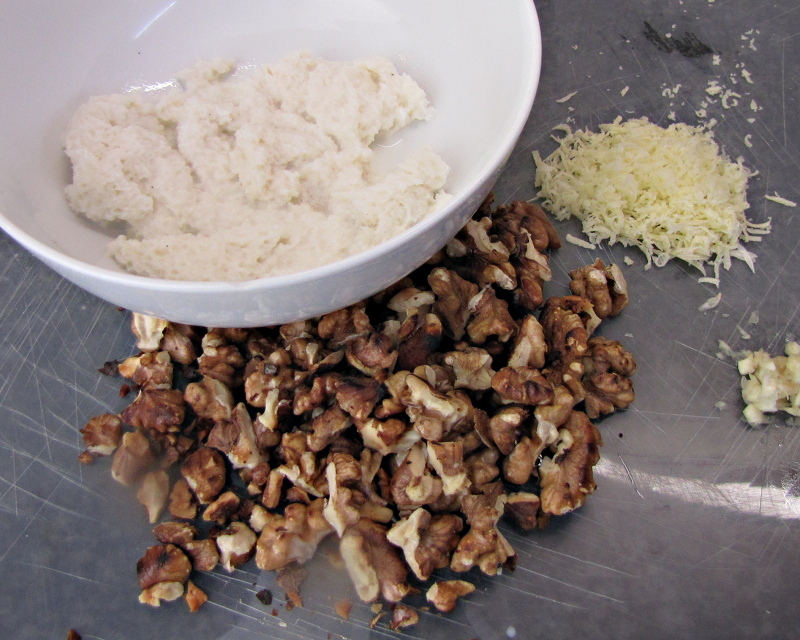 Roast the walnuts in a pan over medium heat. Add to rest of ingredients and blend. Boil the ravioli in salted water until it floats to the top. Combine with sauce and sprinkle with Parmesan cheese (optional). Sautee onion and garlic in butter until softened. 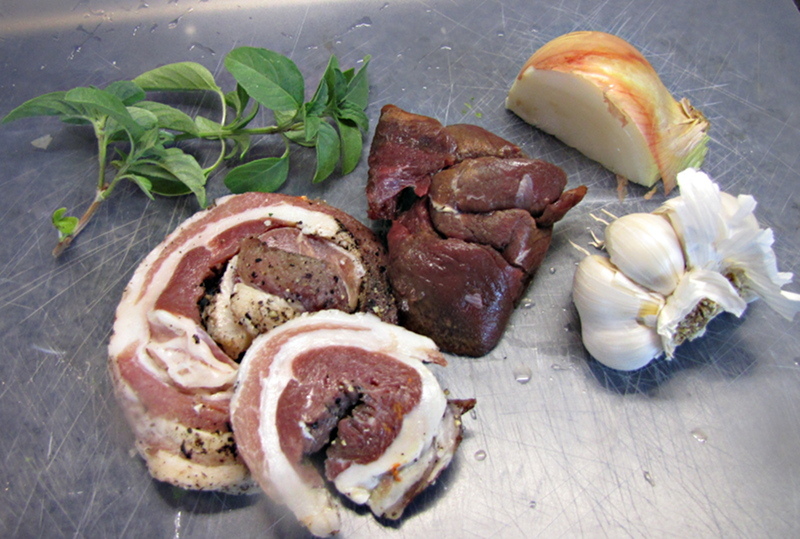 Add the ostrich and pancetta and cook until cooked through. Add the basil during the last couple of minutes. Season to taste. Soak mushrooms in warm water for 1/2 hour. 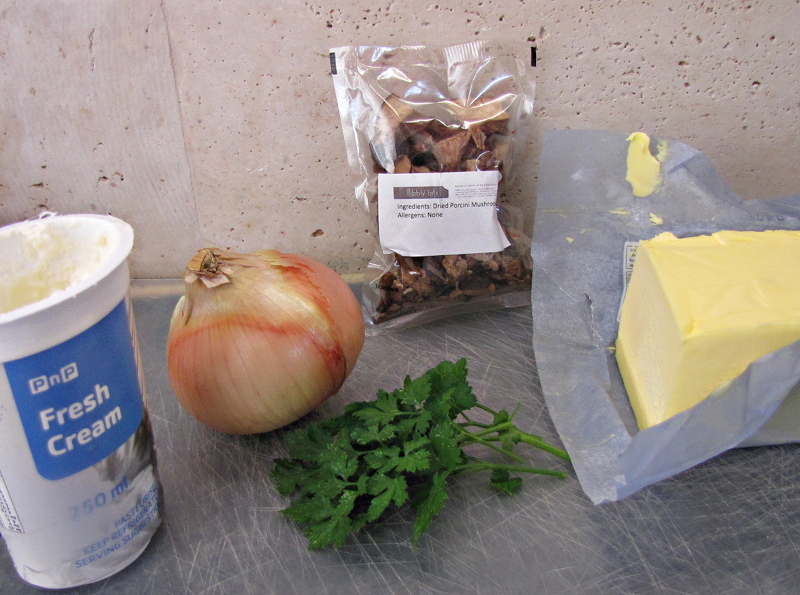 Fry the onion and drained mushrooms in butter until softened. 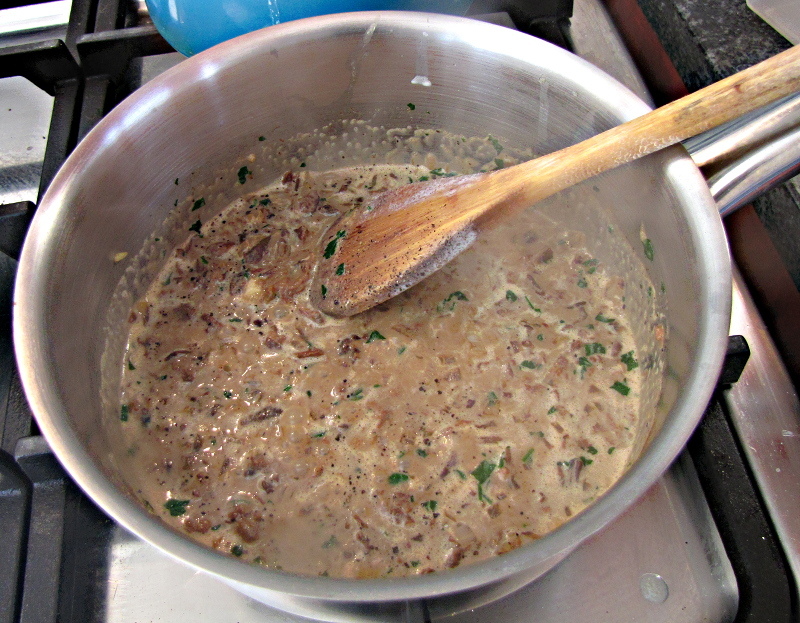 Add the marsala wine, cream and parsley. Simmer until it reduces slightly and season to taste. 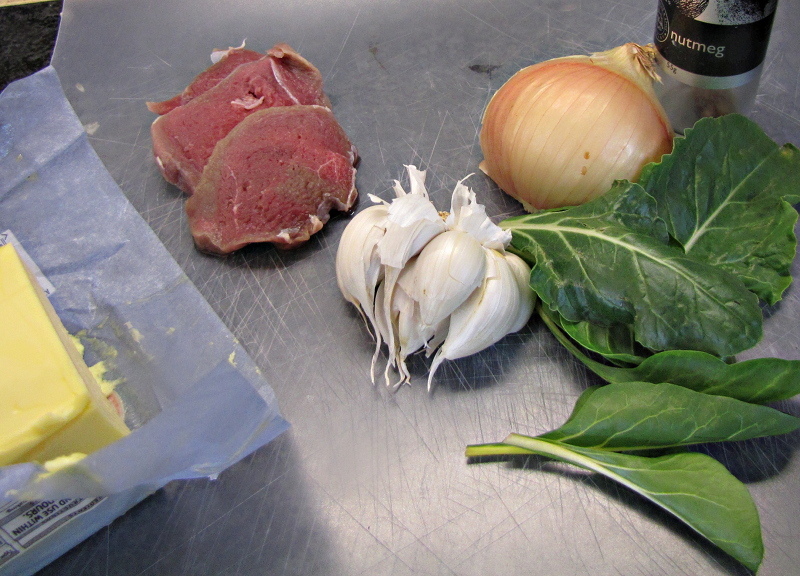 Mix together ingredients and season to taste. Adrienne bought himself a smoker and I had a beautiful piece of smoked springbok loin to use for this recipe. The meat already had spices and seasoning on it so it was not necessary to add anything else to it. 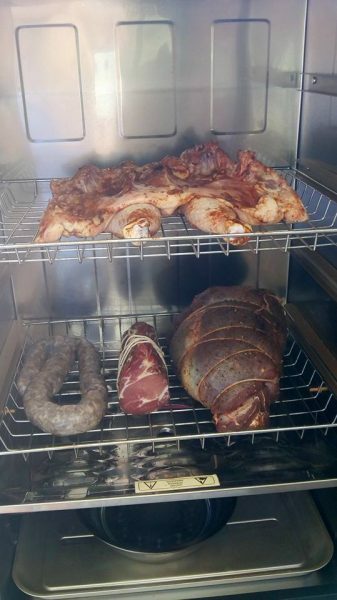 On the first occasion of trying out the smoker Adrienne smoked venison, pork loin, homemade sausage and chicken. Everything tuned out delicious ! Melt the butter in a saucepan over medium heat. 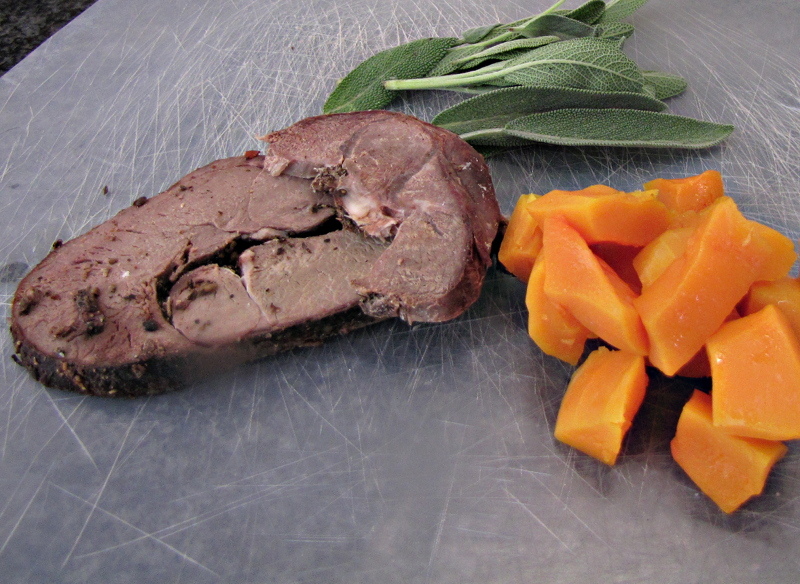 Add sage leaves and cook for 4-5 minutes until the butter has turned nut-brown and the leaves are crisp. Season to taste. 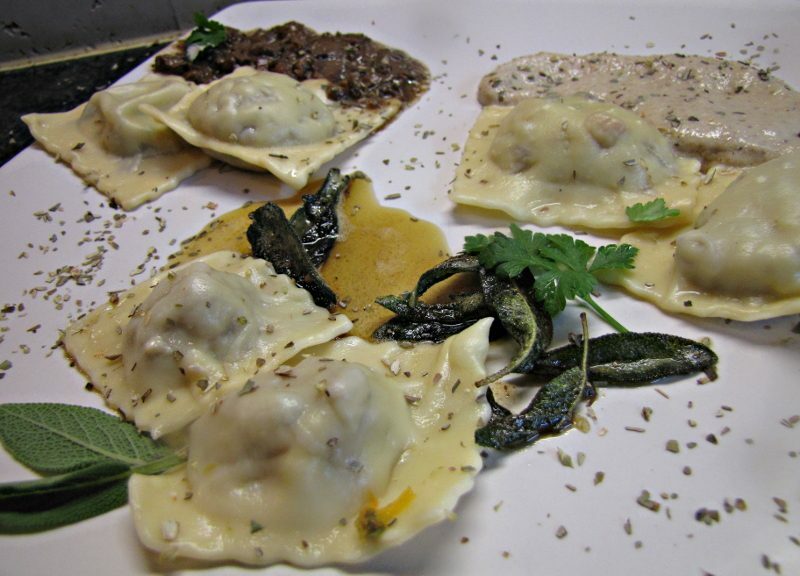 The ravioli turned out well. However the flavour of the sauces overwelmed the flavour of the fillings. In future I’ll only make 1 filling if I’m making different sauces. 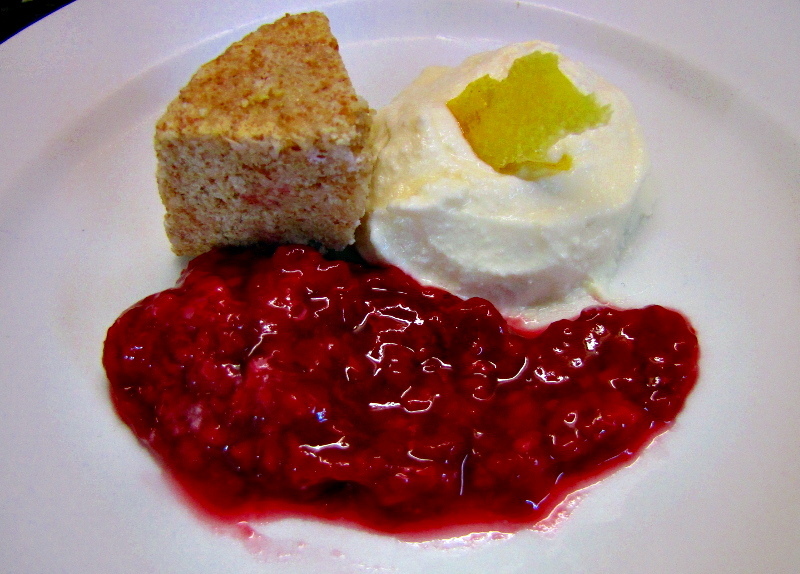 We had a lemon cheesecake with semolina cake and raspberry coulis for dessert. I worked so hard on my ravioli that I forgot to take pictures of the wine. We enjoyed a Mulderbosch Cabernet Sauvignon/Rose 2016 with our Yellowtail Carpachio and a Neil Joubert Shiraz 2013 with our ravioli.